Sony has revamped its digital photo frame line-up. The most interesting launch is the 10-inch DPF-X1000, which joins the company’s X-Series and which is built around a new-generation Super Photo LCD panel claimed to deliver ‘unmatched detail, contrast and brightness’. through the glass’, explains Sony. This series, which comprises of the X800 and X1000, also includes 2GB memory, which means that they are capable of storing up to 4000 photos. images by events, markers or folders. The company has also unveiled the S-Series, which includes frames, which go from seven to 10 inches in size, and feature a expanded choice of Auto Touch-up functions to correct common picture problems. And they will also display HD content and offer a range of slideshow, calendar, clock and fun viewing modes, as well as a new alarm clock function. All S-Frame models also feature an auto-orientation sensor, which ‘flips’ images so they’re always displayed with correct orientation, whether the frame is placed in portrait or landscape positions. 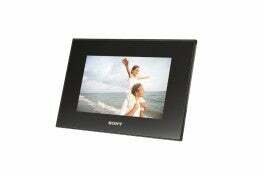 The new range of S-Frame digital photo frames will be available in April 2009. Whilst the X-Series should arrive a month earlier.